Champion Power Equipment 100302 vs Westinghouse WGen3600 — Which gas generator is worth your hard-earned money? These are both great portable generators but the one right for you depends on several factors which we discuss in great detail. Pitting the Champion Power Equipment 100302 hybrid inverter generator against the Westinghouse WGen3600 isn’t really a fair race, but makes for an interesting comparison. What you’ll be left to decide is whether the, much more expensive, Champion Power Equipment 100302 is worth buying when you could get the Westinghouse WGen3600 for about half the price. When reviewing the Champion Power Equipment 100302, you’ll notice it that it has many features and functions that you won’t find on the more modest Westinghouse offering. In terms of power output, they’re pretty evenly matched. So, in effect, it may appear that you’re getting a very similar product. They will both handle a similar load, both in their running watts and peak starting power abilities. Though, if you’re considering the Champion Power Equipment 100302 as your best option, you’ll want to know if you’re spending your money wisely. By comparing it to a generator that is also of a very high quality standard (they’re both very well-made machines), you’ll get to see what benefits you may, or may not, be getting for the extra cash. The price difference is huge, so we’re going to make sure to point out the pros and cons of both generators and compare them on every level. Well-designed. Extended Run Time, Economy Mode and Clean Power. The Champion Power Equipment 100302 represents all the best that modern technology has to offer in a portable generator. At first, I assumed that this was a dual fuel generator – the term “hybrid” usually refers to a generator that is able to use regular gas and natural gas. 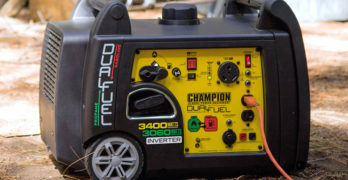 As it turns out, this is a little misleading and the Champion Power Equipment 100302 is not a dual fuel generator. It seems that they use the term hybrid because it’s an inverter generator that looks similar to standard generators. It has a steel frame and the generator is not enclosed like most inverter generators. This means that it doesn’t have the same sound insulation as more modern looking inverter generators. The main advantage presented by the Champion Power Equipment 100302 is its inverter. By now, there’s been a lot of talk about the pros of inverter technology. You get clean, low HD power that won’t cause any harm to your sensitive electronic equipment. The sophisticated electronic controls on most inverter generators allow for a smart-throttle also known as an eco-mode. This controls the engine revs of the generator. When power demand is low, the throttle will slow the RPM on the engine and speed it up when the power demand is higher. This results in significant fuel savings as well as reduced wear and tear on the engine. Both these factors lower your operating costs in the long run. A lower fuel spend and less maintenance is required, thanks to the fact that the engine isn’t working as hard at a lower RPM and won’t run as hot. Includes a standard 30-amp RV outlet. One more advantage of the inverter is the option of parallel connection. While this is not common to all inverter generators, the Champion Power Equipment 100302 does have this function. By synchronizing the sine wave of two generators connected in parallel, it’s able to allow them to function as one. This means that you can double your power output. A single Champion Power Equipment 100302 generator provides you with 3500W running power and 4000W peak load. When you connect two together, you end up with 7000 running watts and a peak of 8000 watts. This is enough power to supply a medium-sized house with enough electricity to run just about every electrical appliance, including high current heating equipment and large air conditioners. The Champion Power Equipment 100302 is also designed for quiet running. Though, I wouldn’t call it the quietest portable generator on the market. For a powerful 3500W/4000W generator, it isn’t too bad when it comes to noise levels. At 64dBA, it is just about at the same noise level as a normal speaking voice. I should point out that some quiet generators can go as low as a little over 50dBA, which is why I say the Champion Power Equipment 100302 isn’t a real winner in this category. Okay, let’s look at the tech specs and design details. The Champion Power Equipment 100302 has a conventional design, meaning that it has a strong steel frame and the generator is mounted to this frame. This is unlike the plastic sound insulated casing found on most other quiet inverter generators. I’d say the old-fashioned steel frame is a more durable way to do things, but it does seem to reduce the effectiveness of the sound insulation. 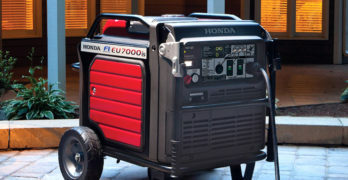 Honda is the only generator manufacturer (that I’ve seen) to combine the robust design of a steel-frame generator with noise insulation that matches the more modern enclosed design of most other quiet generators. 3-year limited warranty with FREE lifetime technical support. The Champion Power Equipment has a fantastic 224cc, 4-stroke dual fuel engine. Thanks to the economy of its variable engine speed, it has exceptionally low fuel consumption. This means that you’ll get an incredible 17-hours runtime (at 25% load) from the 2.9-gallon gas tank. The engine is CARB compliant, so you don’t have to worry about emission level regulations. The weight of the Champion Power Equipment 100302 is also pretty impressive – 81.6 LBS. It doesn’t have wheels, which is a little disappointing to see. It also doesn’t have rubber feet and so the steel frame rests directly on the ground, this is isn’t so great when it comes to reducing vibration. Using the Champion Power Equipment 100302 is easy, though quite basic. It only has a recoil starter with a manual choke (no electric starter motor). Some may find this to be a drawback, but the Champion Power Equipment easy-start technology has done a lot to reduce the hassle of using a recoil starter and it isn’t a heavy job getting the generator running. Your control panel is convenient, with everything in one place. It has two 5-20R 120V household power outlets and a 120V 30A TT-30R RV outlet. You also get a 12V automotive style outlet with a USB adapter. There are no gauges, voltmeter or hour meter. Just circuit breakers for the AC and DC outlets, engine on/off switch, a switch for turning the electric circuits on or off and a switch for the economy mode. It has warning lights for low oil and power overload and the parallel connection ports are placed on the front panel for easy access. So you get all the basics with no complicated switches or dials. The Champion Power Equipment 100302 is the complete package, offering you an inverter with less than 3% Total Harmonic Distortion (THD). It’s very fuel efficient and reasonably quiet. All this, from a robust and reliable machine with excellent dealership backup and a 3-year limited warranty. Visit the Champion Power Equipment site to learn more about their extensive line of power equipment. This is a highly reputable company that consistently develops great products. While the Champion Power Equipment 100302 is a very affordable inverter generator, it may be more expensive than many would prefer. If you’re on a tight budget and want a generator that’s going to give you a similar power output, you’ll be glad to know that there are more affordable options and Westinghouse provides you with one of the best alternatives. The Westinghouse WGen3600 doesn’t offer you inverter supplied electricity, nor does it have an economy mode throttle or parallel functioning – only inverter generators offer this. What you do get if you buy the Westinghouse WGen3600, is a reliable and robust portable generator with a running load capacity of 3600W (100W more than the Champion Power Equipment 100302) and a peak wattage of 4650W, which is 650 watts more than you’ll get from the Champion Power equivalent. The good news is that you’ll be paying considerably less for the Westinghouse generator. It’s roughly half the price of the Champion Power Equipment 100302. So even though you’re paying less, you get slightly more power and it has a few other advantages too. The engine on this generator is an incredibly robust 212cc OHV 4-stroke power plant with a cast iron sleeve. This engine is also CARB, CSA, and EPA compliant, so it meets all environmental standards. Though it doesn’t have the electronically controlled eco-mode of the Champion Power Equipment 100302, this generator is not all that heavy on gas. You’ll get around 12-hours of run time (at 50% load) from the 4-gallon gas tank. Your runtime compares quite closely to the Champion Power Equipment 100302, but this is from a considerably larger gas tank – so you will be paying quite a bit more for fuel. The Westinghouse WGen3600 has a really solid frame, constructed from 1” steel tubing. It’s a heavier machine than the Champion Power Equipment 100302, weighing 112 LBS. Though this generator has the advantage of a wheel kit and handle. The 8” solid wheels make it much easier to move than the lighter Champion Power generator that doesn’t have this luxury. Along with the wheels, it also has rubber feet and the combination of these two features, result in lower vibration levels. This model does not include the wheel kit. The control panel on the WGen3600 differs slightly to than the one on the Champion Power model. You get the same 5-20R 120V 20A duplex household outlet and RV (TT30-R) outlet, you also get an L5-30R receptacle – something that you don’t get on the more expensive generator. It’s nice to see that the outlets on this model have rubber covers to protect them from dust and moisture, another feature that you won’t get on the Champion Power Equipment generator. What’s not so cool is that you don’t get a 12V battery charging outlet on the Westinghouse. Like the Champion Power Equipment 100302, this one has a recoil starter only – no electric starter. The engine on the Westinghouse is just as easy to start, just one pull should be enough to get it started in just about any weather conditions. Other than this, you get the same switches (except for the economy mode), as well as the same warning lights and circuit breaker overload protection. The Westinghouse also has no gauges, voltmeter or hour meter. I don’t have noise level specs for the Westinghouse WGen3600, but I’m very sure that it’s quite a bit louder than the Champion Power inverter generator. So if you look at the specs, you’re getting a very similar generator to the Champion Power Equipment 100302, with the obvious exclusion of the inverter. You do, however, get some advantages that you won’t find on the more expensive generator – most notably, the wheel kit. As far as quality and durability go, they seem to be quite evenly matched and I’d say that both are very well constructed generators and make use of highly durable materials. This is evident by the 3-year warranty that you get on both the Westinghouse WGen3600 and the Champion Power Equipment 100302.